Farmers and gardeners, watch your crops and flowers. The National Weather Service issued another freeze warning Saturday beginning at midnight through 9 a.m. Sunday morning for Alameda, Contra Costa, Marin, Napa, San Mateo, Santa Clara and Sonoma counties. 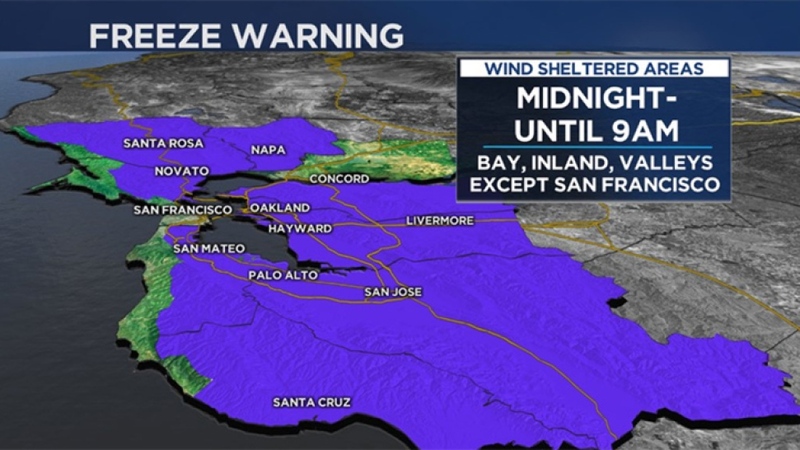 The NWS Freeze Warning does not include San Francisco or the bay shoreline. The day after Christmas, residents of Novato woke up to frost on their lawns and cars. It was cold enough for ice to form in Dublin. Temperatures early Saturday are expected to drop down as low as 28 degrees in Napa, 29 in Walnut Creek, 31 in San Jose and 31 in Gilroy.